Moving can be one of the most stressful times in our lives but at FROGBOX we’re committed to making your life easier as you move with our clean and environmentally friendly moving boxes. We also love to provide pro-tips and fun how-to’s to help you get from one pad to another a little more stress-free. One of the things our customers want to know is what the most effective way is to pack up the house quickly and safely without ruining any of their precious goods! We’re excited to bring you a variety of video’s that focus on each part of the house that you can watch prior to your move. Even if you’re not moving, we hope these informative video’s can inspire you on the ways to best pack your belongings in a box for whenever you need it! The first in our series features the kitchen – one of the most loved and central parts of the house, where we spend the majority of our time entertaining, eating and cooking. As such, the kitchen is also the place with big accessories (Vitamix, food processor or the crockpot) that can be bulky and fragile and the smallest of items (wine topper, magnets or can openers) that can easily be lost among the other items when we pack. We’re excited to have teamed up with Vancouver In The Box, a Vancouver packing services company, to show you how to pack your small and large FROGBOX with ease. And how we recommend to label your boxes for quick access into your FROGBOX without having to open them. We offer pro-tips on how to care for your bulky and fragile items, how to pack sharp items and what the ideal weight of the boxes should be after packing. 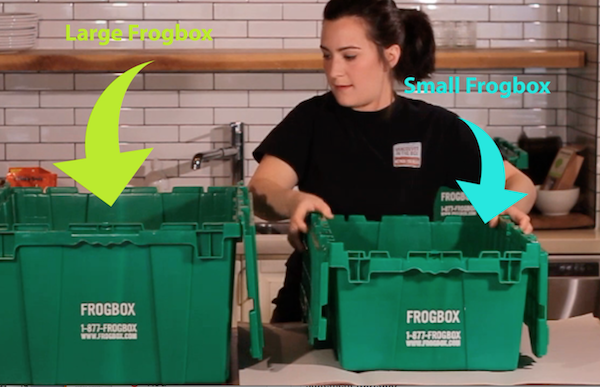 We hope you enjoy our How to Pack Kitchen Items Using FROGBOXES!